It is a flat-out ridiculously great week at the video store, with five of 2008’s most acclaimed, must-see, love-‘em-or-hate-‘em-they’re-sure-to-be-talked-about-for-decades-hence kind of movies: Milk, Rachel Getting Married, Happy-Go-Lucky, Synecdoche New York and Let The Right One In. Add in the animated classics Pinocchio and Gulliver’s Travels in new special editions, a complete collection of the superb Robbie Coltrane crime series Cracker, and even the legendary so-bad-it’s-bad boondoggle Howard The Duck and man, where do you start? But with all that goodness (and in one case, sublime badness) to sort through, it would be a shame if one of ‘08’s undersung gems got lost in the shuffle. 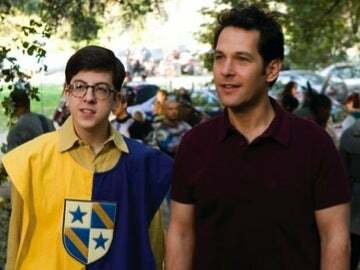 If you haven’t seen it yet, don’t miss Role Models, which combines the snarky comic stylings of Paul Rudd and The State/Stella crew (with a few Apatow vets thrown in) and the underdog-makes-good/slob-versus-snob uplift of classic ‘80s comedies. It’s a real treat.